[Available in French]. 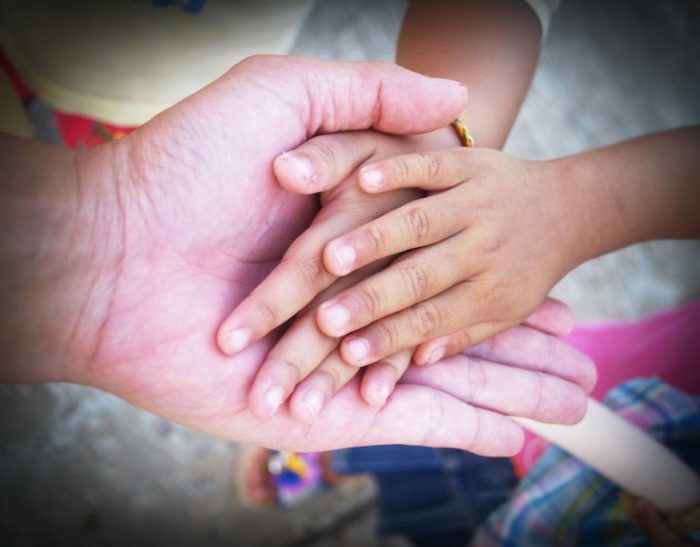 Adopt4Life—Ontario’s Adoptive Parent Association, and Western University, in partnership with the Adoption Council of Canada, are spearheading a national campaign for 15 weeks paid attachment leave for adoptive parents and kinship and customary caregivers. They are taking their case to Ottawa again in April 2019 to build on the momentum of their November, 2018 meetings on Parliament Hill. The #TimetoAttach team will present compelling arguments from research conducted at Western about the need for paid attachment leave. Read the full article on Western News. Chair of the Ontario's Adoptive Parents Association board and Western University professor and researcher, Carolyn McLeod tells London Morning why adoptive parents could use an additional 15 weeks of parental leave. From CBC News: An additional 15 weeks of leave could grant parents more time to bond with their children. Read the full article. November 30th, 2018—a statement by Karen Vecchio, MP for Elgin-Middlesex-London, where she supports and summarizes Adopt4Life, ACO, and Western’s faculty members’ efforts to spread Awareness to Parliament. View the statement on Youtube. Last week, Western researchers and their community partners went on a whirlwind trip to Ottawa to meet with several MPs and policy advisors. 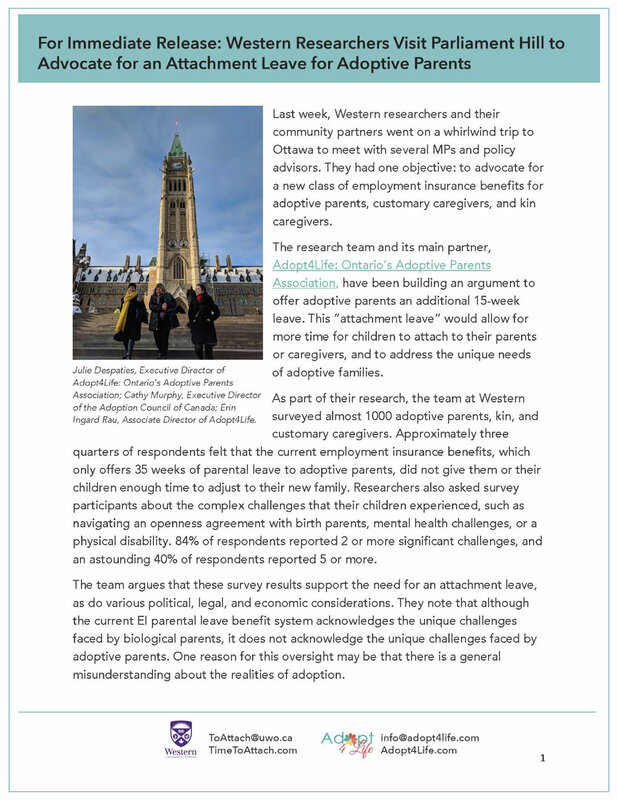 They had one objective: to advocate for a new class of employment insurance benefits for adoptive parents, customary caregivers, and kin caregivers. 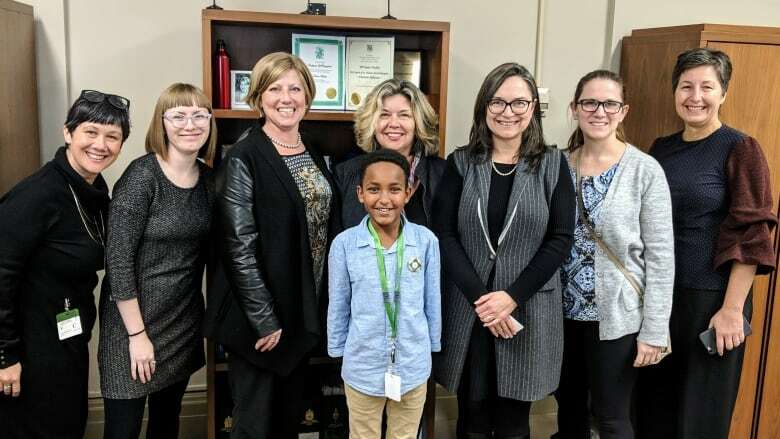 The research team and its main partner, Adopt4Life: Ontario’s Adoptive Parents Association, have been building an argument to offer adoptive parents an additional 15-week leave. From left to right: Erin Ingard Rau (Adopt4Life associate director), Julie Despaties (Adoppt4Life founder), Cathy Murphy (executive director of Adoption Council of Canada), Nicole Fice (Western PhD student) and Leona Bruijns (Western PhD student) with Calgary Shepard MP Tom Kmiec.